Having a mix of conventional American/European and Asian style knives that need to be sharpened but in a dilemma to find the best sharpener? Read on. In this situation, you would not look for a dedicated 20-degree or 15-degree angle sharpener. Not even the Chef’s Choice Trizor XV model that effectively converts American style knives to the thinner 15-degree angle blades. In this article, we’ll review the Chef’s Choice 1520 AngleSelect that will handle both classes of knives in a very short amount of time. When you purchase an electric knife sharpener, not only will you have to consider how safe it is but also what else makes it snappy and simple to use. 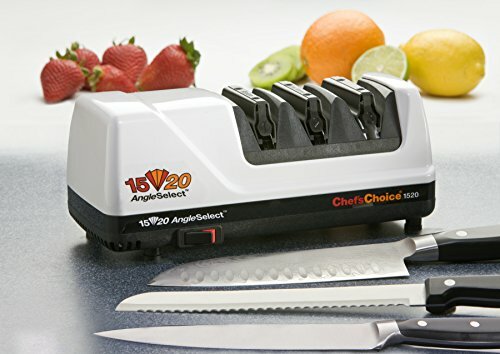 Chef’s Choice 1520 AngleSelect Diamond Hone Electric Knife Sharpener is truly one of the most versatile sharpeners. Surprised, why? You’ll get a list of reasons. Tie your seat belt and get ready for the bullet train journey of how awesome it is! Stage 1 is for 15-degree edges. You would sharpen Asian style knives only in this stage. Stage 2 is for 20-degree edges. You would sharpen your typical European/Western (Wusthof, Henckels and so forth) style knives only in this stage. Stage 3 is a flexible stropping stage to hone the edges for both classes of knives. This stage sharpens serrated knives, too. One of the best Chef’s Choice electric models is the Tizor XV. It’ll deliver amazing sharpness but that will convert your knives to 15-degree edges. Not anymore. The versatility of Chef’s Choice 1520 will no longer forced to put a 15-degree edge on all your blades since it has dedicated stages for both 15 and 20-degree edges. We’re glad to see that Chef’s Choice actually took this initiative and brought all our consideration into reality by improving the model 1520 to cater consumer’s need. It can handle hunting, boning, craving, serrated, Santoku, cleaver, and Japanese style single bevel knives. But don’t go crazy and try the axe, mowing, machetes, and ceramic blades. The non-slip base of the 1520 AngleSelect makes this unit a simple and safe sharpener to use. It doesn’t move an inch from the spot where you put it on the countertop. The 100% diamond abrasives in stage 1 and 2 and the flexible stropping disks in the final stage combined will deliver hair-splitting sharpness. 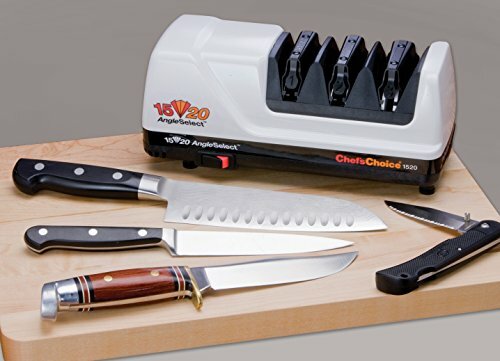 Chef Choice 1520 Angle Select Hone Sharpener has a general size of 12 x 6.2 x 6.4 inches. This gives it a little impression that consumes less space on your kitchen top. It additionally renders it more compact so you can without much of a stretch take it with you on your outdoors trips. Yes, a solid 3-year manufacturer’s warranty holds for this product. It doesn’t, however, mean that you can use it the way you want. Make sure you use it properly as described in the manual. Read the instruction manual first. If you’ve ever observed a sushi knife, you’d definitely amazed by the thin slice of fish they can cut. Have you noticed how thin the edge of the sushi knife is? Most sushi knives are single-bevel. The Chefs Choice 1520 can do single-bevel honing on both Western and Japanese style edges, too. Another outstanding feature is the way that it’s unbelievably quick to restore dull blades. The powerful motor does the job well, and quietly. One minute is what it takes to re-establish cutting edge sharpness. It just needs 10 seconds to polish the blade. In case you’re a blade collectioner, use this on pocket and sporting knives, too. The Chef’s Choice 1520 is not constrained to honing just kitchen cutlery. It enables one to have full control over the sharpening process. The high precision spring angle guides will ensure the blade will not wriggle when you draw the knife through all stages. Therefore, the final result is always a clean and sharp edge. Since it can sharpen both types of angle blades, users must select the correct stage for the type of knives. Messing it would damage the blade beyond repair. It’s not cheap if you compare with other models. But for its versatility and quality, it’s worth to invest in this sharpener that will last for many years to come. We’ve collected different types of knives over the years. Sometimes it’s difficult to differentiate the angles because we didn’t care much about it initially. When it needs to restore its sharpness prior to use, we had a hard time to determine which stage to use. It’s advisable to group the knives based on its bevel angle (15 or 20-degree). We found the bamboo drawer knife block (knife organizer) and the chef knife bag very handy. Just need a few minutes to segregate the types of knives and organize them separately will do. It’s kind of convenience and you may not know when you need to use it. But anytime you feel the need to sharpen it, you’ll know which stage to use out of the box. One reason that puts people off using an electric knife sharpener is the fear of the heat that will damage the steel temper. We’d not worry on that with the current technology. The manufacturer (EdgeCraft) takes care of it. In fact, there isn’t any blade clamp to hold and heat up the knife during sharpening. Furthermore, everyone who operates the sharpener should read the instruction manual before using it. For years, the 1520 AngleSelect had scored high points in terms of versatility, built quality and sharpening results. If the knives were damaged, it was always the handling issue and not the fault of the machine. The powerful motor and the diamond abrasives surely deliver astonishing results. Users have the best of both worlds to get razor sharpness using this well-crafted, all-in-one knife sharpener. The price is not a deal breaker if you consider the long-term benefits over the cost of sending a bunch of knives to professional sharpening service. The sharpener was designed all the way up to suit a beginner as well as the experienced user. The high precision angle guides will automatically position the blade at an appropriate angle to get the best results every time. It takes the guesswork out of sharpening. Within minutes, you can restore a bunch of knives better than factory sharpness. Buy it if you can afford. The Chef’s Choice 1520 AngleSelect Diamond Hone Electric Knife Sharpener is an excellent investment if you love sharp knives.